There’s no ignoring social media in 2018. It’s how we find, research and interact with businesses. And, social media isn’t going anywhere. If anything, its usage is only growing. I’m sure you know you need a social media marketing strategy, but where are you supposed to get started? Well, this blog post has you covered. Here's your step-by-step breakdown for building a strategy. 1. Find the right social platform(s). Finding the right social platforms can be tricky. Your industry, target market, budget (if you’re working with an agency) and available time (if you’re DIYing it) will determine which platforms will work best for your business. Wondering which social networking sites your business should use? Well, your first step should be figuring out where your target audience is spending their time. Let's break this down by social demographics as well as overall popularity. Pretty much everyone has a Facebook account. 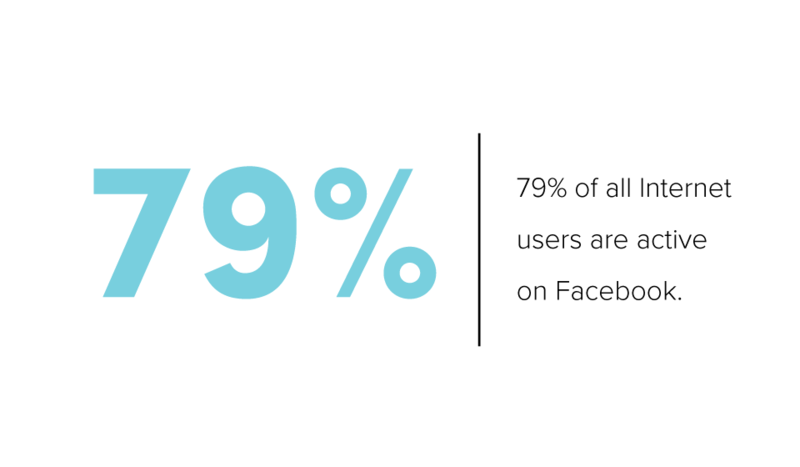 In fact, 79 percent of all internet users are active on Facebook. Facebook is most popular with people from 18-29 years old (88 percent of people in this age range have a Facebook account). Next up is the 30-49 age group (84 percent) followed by people 50-64 years of age (72 percent) and people who are 65 and above (62 percent). Twenty-six percent of men and 38 percent of women use Instagram. Instagram is hugely popular with people between the ages of 18-29, but you can also find users from 30-49 years old on the photo-sharing platform. And, advertising on Instagram tends to be pretty successful. In fact, 75 percent of Instagram users will take some sort of action (like visiting your website) after viewing an Instagram ad! Lots of social experts keep saying Twitter is dead or dying, but 24 percent of men and 25 percent of women still use Twitter. Most of Twitter's users are from 18-29 years old, so if you're targeting a younger crowd, it's the place to go. While LinkedIn might not seem like the most important social network out there, many people use LinkedIn to network, find new jobs and hire new employees. In fact, 31 percent of men and 27 percent of women use the professional networking site. You can find people between the ages of 18-49 on LinkedIn. The networking site is a great place to share industry news, find employees and look for networking opportunities. Is Anyone Still Using Google+? Google+ is used by a small number of people from every age group, but it's most popular with people from 25-34. I know Google+ isn’t the first social network you think of either, but it’s important. Because it is a Google product, you should maintain an active presence on Google+ to show the search engine that you are active and relevant. Besides, Google+ can help improve your local search ranking. In terms of popularity, here’s your breakdown of monthly users for each site. Facebook is the most popular social website by far, with 2.23 billion monthly active users. Next is Instagram, with 800 million users, followed by Twitter with 336 million monthly visitors. Estimates vary for Google+, but according to research from June 2017, Google+ sees 111 million monthly visitors. LinkedIn comes in just below Google+, with 250 million. Once you know where your target audience is, you know you should be using that social network to reach them. Example: Let’s say you run a retirement community targeting seniors in your area. Facebook reaches more seniors than any other platform and has more users than others. You should start by focusing on Facebook marketing. Final note about choosing your social marketing sites: It’s better to focus on doing well on just a few of these than to try to be everywhere and fail at all of them because you’re trying to do too much. And, if you look at demographics and popularity, it's clear that most businesses should have, at least, a Facebook account. Now that you know where to post, let's talk about how often you should be posting across social. 2. Figure out how often to post on social networks. 3. What should you be posting on social media? Social media is a great place to keep your business fresh in the minds of local consumers and showcase your best services, products and promotions. But keep in mind that you shouldn’t be promotional all the time. If you talk about yourself too much and constantly push for sales, you’ll probably lose followers because people will feel like you’re spamming them. The way to avoid this is to post a mixture of original and curated content. What types of original content should local businesses post on social media? And, remember, don’t make it all about you. Sprinkle in some curated content to break up your promotional posts. We use our social posting and monitoring tool, Radiate, to find curated content for clients. But, if you don’t have a tool to curate content for you, you can share industry blog posts you think your followers will find interesting. 4. How to optimize your social media profiles for local search. Make sure to optimize your social profiles for local search. While you’ll face character limits on some profiles, websites like Facebook allow you to add plenty of info! Make sure (if you can fit them in) to add NAPUE (business name, address, phone number, website URL and email). Don’t forget to add keywords to your profiles whenever possible. Don't stuff your profiles with too many keywords, but make sure to add your business’s name and category (pizza place, retirement community, cat cafe) in there a couple of times. Social media marketing is a great way to target consumers on the platforms they are already using every day. Social isn't just something you can set up and be done with, though. If you neglect your followers, they will either unfollow or forget about your business. You'll need to maintain an active presence, so make sure you're posting and interacting with your followers on a regular basis.